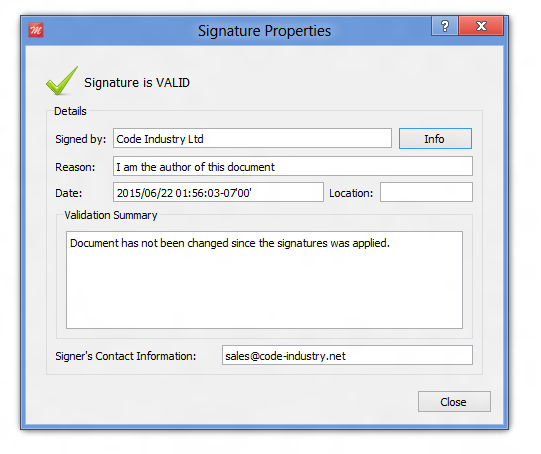 Master PDF Editor can be used for digital signatures validation in PDF documents. When you validate a signature “Hand Tool” must be on. Click with left mouse button a certificate to see a window with certificate validation result. Signature is validated, so there were no unauthentic changes applied to the document, and the issuing certificate authority is trusted. There were problems validating the signature. The problems can include changes to the document after the signature was applied. Signature is validated, document wasn’t changed after signing, but the certificate isn’t trusted. For Windows and Mac OS X: You have to add public key of the certificate to the system certificate store. For Linux: Click “Info” and after viewing certificate properties press “Add to Trusted Identities” button.